Welcome to this month’s Blogorail Red Loop. Today we are touring some of the great bars and lounges you can find at the Disney Parks. 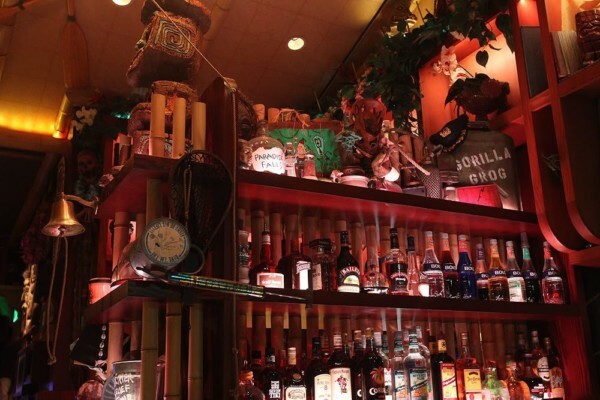 Trader Sam’s Enchanted Tiki Bar at the Disneyland Hotel in California opened in May 2011 and is still one of the most remarkable examples of Disney storytelling. 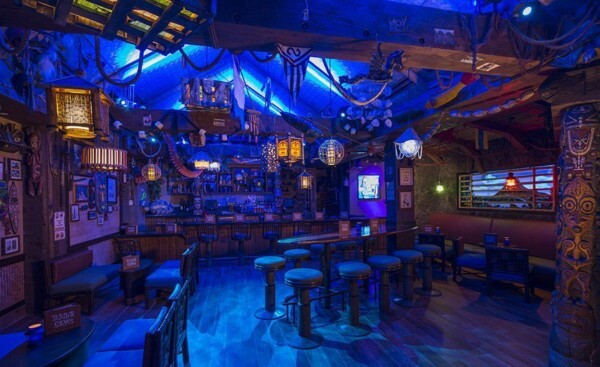 In April 2015, folks on the East coast were treated to their own version of this special lounge, when Trader Sam’s Grog Grotto opened at The Polynesian Village Resort. Trader Sam is the “Head Salesman” you’ve run into now and then on the Jungle Cruise, and these lounges are his latest venture. 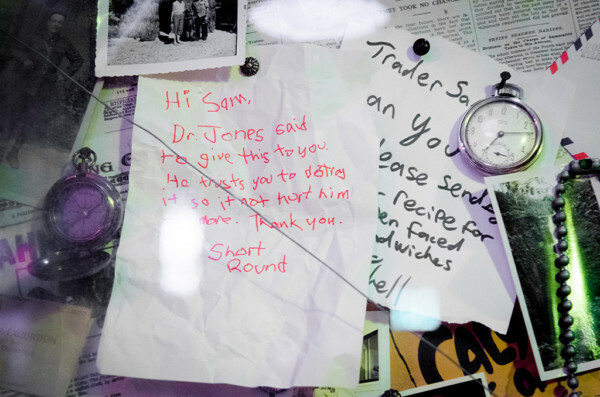 Letters throughout the Enchanted Tiki Bar tell more of the story, including how Sam worked with the Jungle Cruise Navigation Company to decorate the bar with artifacts and relics that had been gathered on their adventures around the globe. The Tiki culture has always been a staple in Disney history. 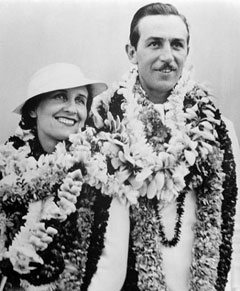 Walt and Lillian traveled to Hawaii many times, beginning in 1934. On one of those trips Walt promised fans “Mickey on a surfboard,” and in 1937 he delivered with the film Hawaiian Holiday. 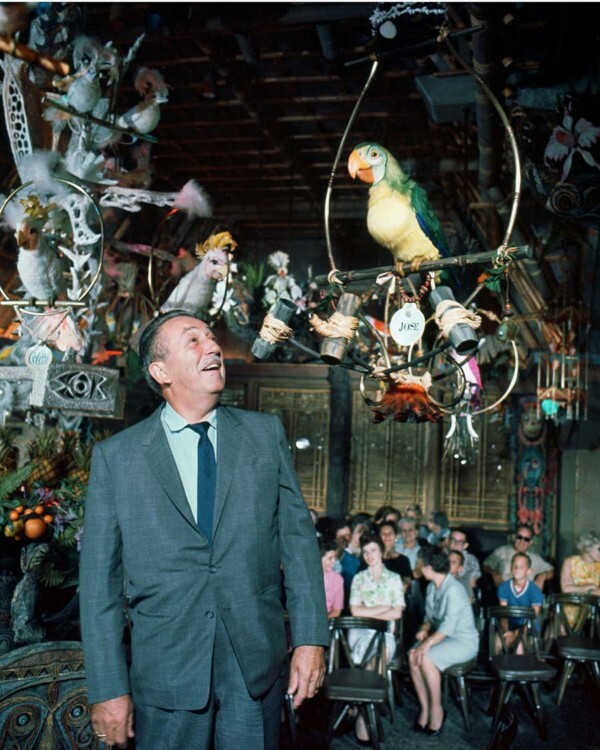 In the 1950s, Walt’s – and much of the country’s – fascination with Tiki Culture grew. 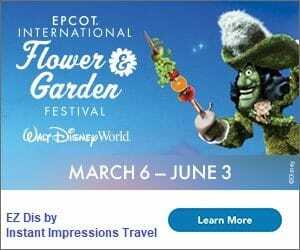 He celebrated the Polynesian culture beginning with the Enchanted Tiki Room – Tropical Serenade in 1963 (and Adventureland in general, no matter the park) and The Polynesian Village Resort that opened with the Magic Kingdom in 1971. The couple visited several more times both for pleasure and business, filming movies such as Robinson Crusoe in the Aloha state; later, the company would film more in Hawaii including Pirates of the Caribbean movies, George of the Jungle, and Pearl Harbor, and finally open their own tropical paradise, Aulani, on Oahu in 2011. As you can expect, fans of the former Pleasure Island destination The Adventurer’s Club will see several homages to the now defunct experience. You probably won’t be surprised to also see tributes to the Tiki Room, the Jungle Cruise, and Indiana Jones. 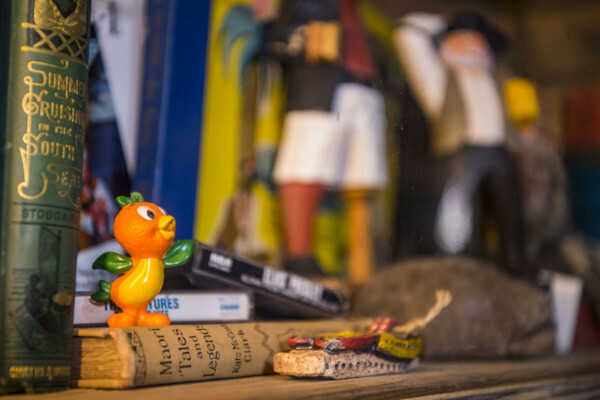 More surprising cameos are made, though, by Florida’s Orange Bird, Miss Tilly (of Typhoon Lagoon fame), 20,000 Leagues Under the Sea, and even Up! You could spend hours just looking at all of the hidden gems covering just about every surface of the lounges. Be warned! 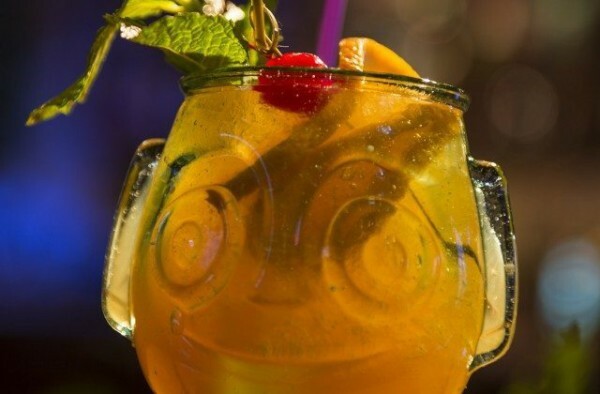 Ordering certain drinks disturbs the Tiki Gods (much like you may have done when visiting the Enchanted Tiki Room), and it seems the locals and the bartenders actually enjoy conjuring up this trouble. We’ve personally enjoyed volcanic eruptions caused by Krakatoa Punch and the appearance of the Tiki God of Disaster (and fire you’re actually encouraged to play with!) upon ordering an Uh-Oa. We’ve been able to see many of the other drink presentations as well. Here are a few, just so you get the idea – I don’t want to spoil the fun! Both locations are very intimate. 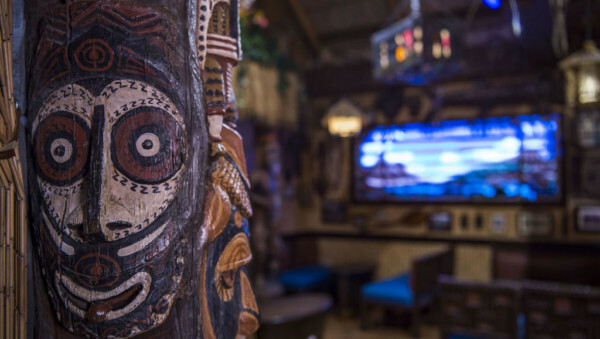 The Enchanted Tiki Bar in California seats 47 people, but actually feels even more pronouncedly small than the 51-seat Grog Grotto in Florida. The walls are already covered in souvenirs and tchotchkes, so the close proximity of guests actually feels more cozy than crowded – especially when the whole lot of visitors joins in with one another during chants and the aforementioned specialty drink presentations. As we’ve come to expect from Disney – especially in a unique story such as this one – the details are infinite. You know you’re going to see things all over that tell the story, but the supporting details are just as cool. My favorite has to be the “Dark and Tropical Stormy” drink umbrella that has clearly been affected by the originating storm. 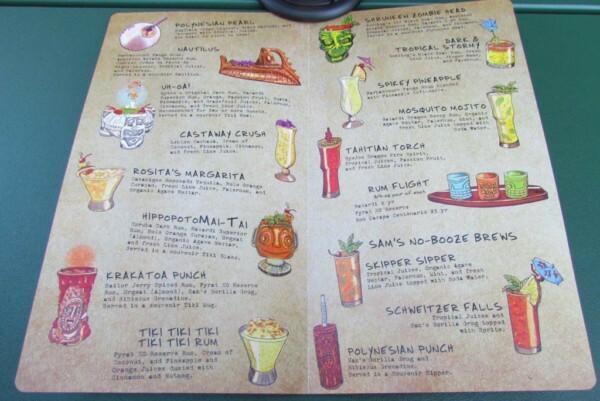 I also love the drink names that are punny throwbacks reminiscent of a Jungle Cruise expedition, such as Tiki Tiki Tiki Rum, Shrunken Zombie Head, Schweitzer Falls, and the Hippopotomaitai. In general, what could be a cramped, campy experience actually turns out to feel like family and friends sharing inside jokes – and adventures. Ok. So “free” is a pretty huge stretch. Most of the drink items are incredibly pricey (we’re talking up to $52! ), but that price tag often includes souvenir drink containers. Many of them have a series of mugs, etc so you could even begin a (very expensive) collection on repeat visits! Keep in mind if you don’t want to souvenir, you can almost always order the drinks in a regular cup-shaped cup at a lower cost. 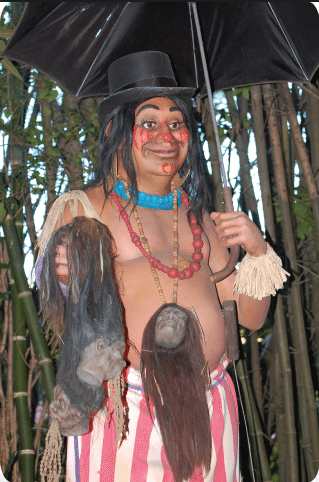 Some people absolutely rave about the food at Trader Sam’s. We thought it was pretty good, but definitely overpriced when considering there are better dining options throughout both the Disneyland and Walt Disney World resorts. That said, you’re going to want to carve out a few hours if you can, to really experience all that these lounges have to offer – and the island-themed food really does add to the experience. My suggestion would be to eat a little before you go, and go with friends so you can order different items and create your own sampler. If you do find you love the food (or drinks), keep in mind that if you’re in Florida you can always order and eat outside on the Tiki Terrace. The Trader Sam’s ambience is obviously missing, but it’s replaced by a different (but still lovely!) one. You’ll usually be treated to live ukulele music as you overlook the Seven Seas Lagoon nearby. Please note: waits at either location during busier times can be quite long. Kids are welcome most of the time, but after 8pm the bar is for guests 21 and older. 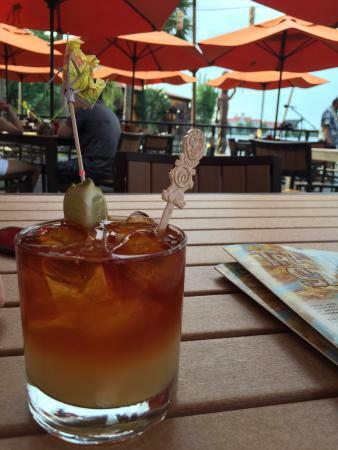 For more great Disney bars & lounges,check out the other great posts from the Blogorail! 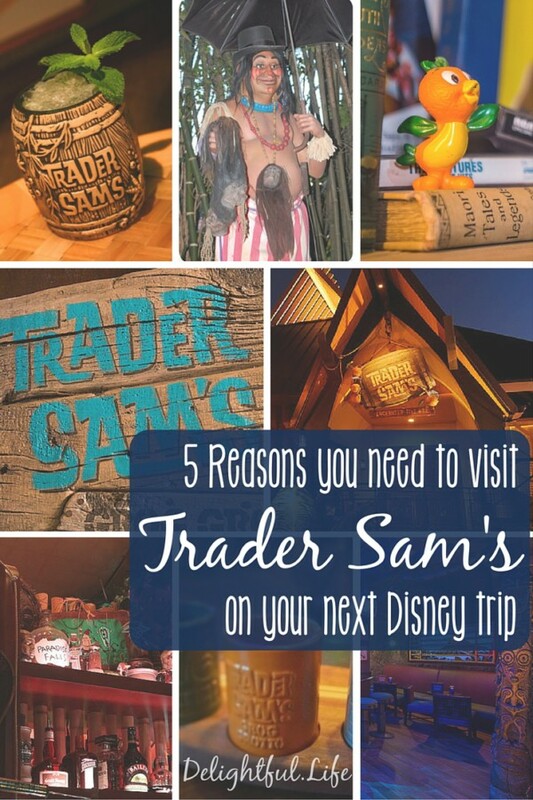 I adore your inclusion of Walt history and the backstory behind his fascination with all things Tiki; the information makes any visit to Trader Sam’s (on either coast) so much more of an immersive Disney experience. Come to think of it, my grog mug collection could use some work!!! 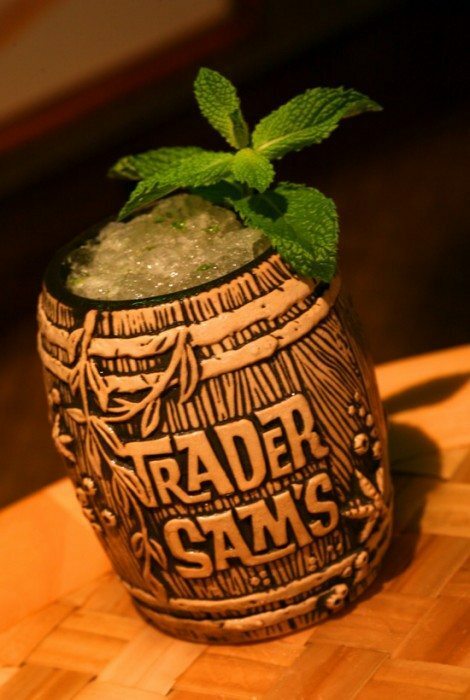 I went to Trader Sam’s in WDW last August. Wish it was a bit bigger or had longer hours. We were not able to find a seat so we had to leave. But it looked like a lot of fun. Great overview! 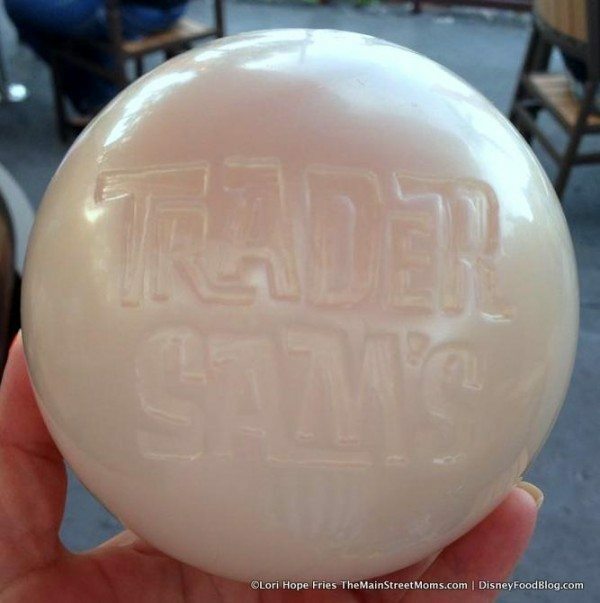 I have yet to visit either Trader Sam’s (may have to be from the fact I always have kids in tow). It is definitely one thing ai want to experience when I have the time to really enjoy it. Love the tip you can get the drinks without the expensive cup. I haven’t been to Trader Sam’s in Walt Disney World yet, but the one in Disneyland is one of my favorite bars of all time – Disney or not. 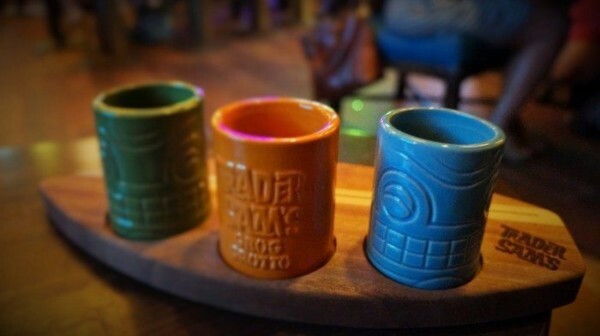 So many fun facts I didn’t know about how these bars to came to be – this post made me fall in love with Trader Sam even more!